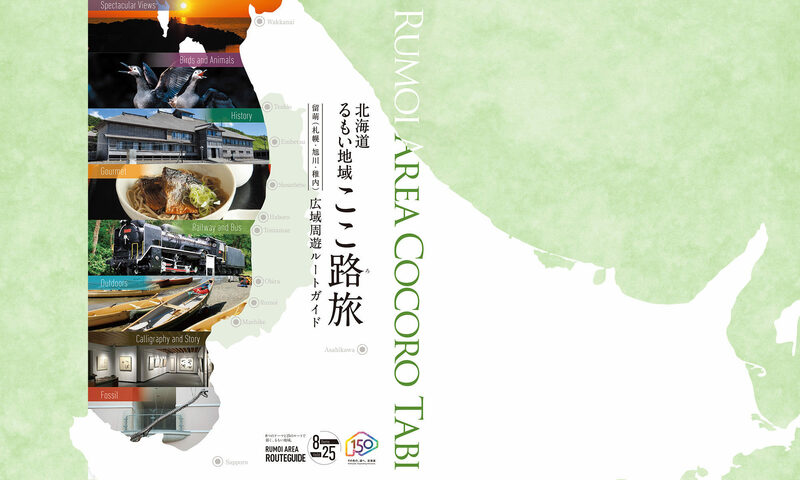 Railroads were vital for transportation of goods and people along the coasts and mountains of Rumoi subprefecture. 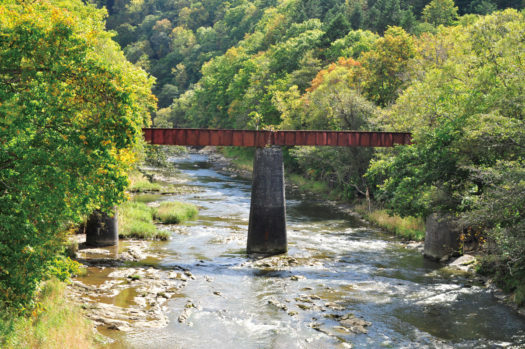 Although many of the trains are now out of service, the railroad beds remain to remind us of their valuable service. 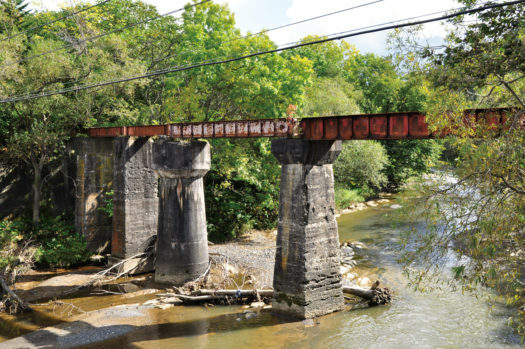 Wouldn’t a journey to find these tangible reminders of the railroad boom be an interesting one? ※The names of stations and connecting railroads remain at the time of closure. The line which connected Chikubetsu Station and the Chikubetsu mine was opened in 1941 in connection with the start of operations at the Taiyo Soda Co Ltd. Haboro coal mine. The line also ran passenger cars from 1958, and the Sankebetsu branch line, which connected Akebono and Haboro, was also opened. Operations at the Haboro coal mine began in tandem with the opening of the coal mine railroad line. The main office of Haboro Mine Railroad was in Sapporo, and stock from this large company was traded on the Sapporo stock market. 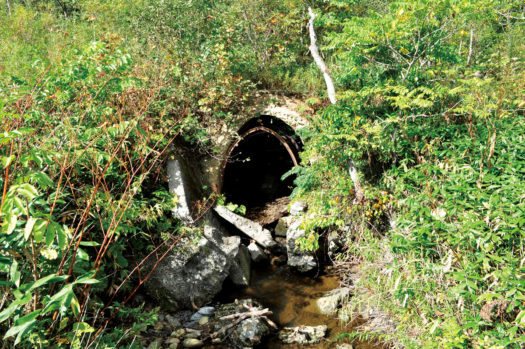 However, this line was closed when operations at the Haboro mine were terminated. Since then, public transportation along this route has relied on the Engan bus company. 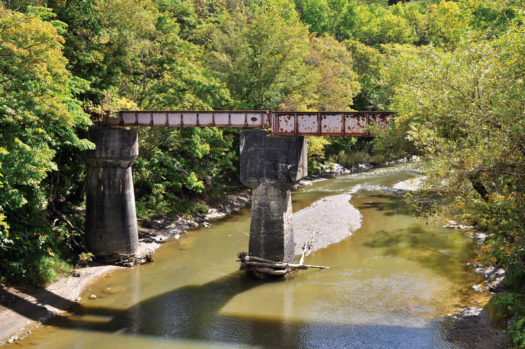 Due to wartime shortages of materials, the bridges were made out of salvaged scrap metal. Their uneven construction is a unique feature of this route. There are pictures of these bridges, but you can also observe the actual remains of the Fourth and Fifth Chikubetsu river bridges. You can also see various memorabilia, such as station signs, at the Haboro Museum. 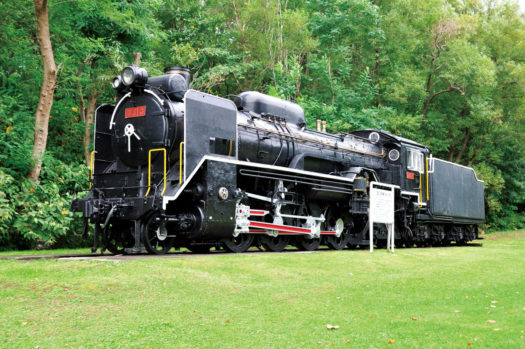 In addition, a SL steam engine, which transported coal from the Haboro mine, is on display at Miharashi park in Rumoi City. Construction on the The Sankebetsu branch of the Haboro Mine Railroad began in 1962 by Japan National Railway. It was originally planned as the “Meiu Line” which was to connect with Haboro Line and Shinmei Line Shumarinai Station. Because of increased coal output at the Haboro and Kami Haboro mines, there was a need to augment transportation with additional railroads and so this additional line was planned. Tunnels and bridges on the stretch extending from Sankebetsu were almost completed when the Haboro mine was closed and construction on the line was discontinued. Plans to connect this line were not formally scrapped until 1989. Pillars, platforms and tunnels still exist near the 2nd Haboro Dam, thus earning it the name “Maboroshi no Tetsudo” or Phantom Meiu Line.